Been trying my hand at a new field of action, specifically an early Battlefront Tiger in 15mm for Flames Of War or some thing similar like Rapid Fire rules. …..what a pain in the arse 15mm is compared to giant 40k models. All credit to people who paint 15mm stuff its seriously fiddly. Problems I have encountered so far and as I mentioned its not finished yet ! Battlefront Tigers don’t come with assembly instructions. Ever tried removing a metal jack in 15mm scale from a sprue and not cutting your fingers off ? Tiny parts of metal need super glue which by its nature runs and the parts stick to you. My detail brush is well small, but not small enough for 15mm. Even with super glue small parts fall off days after while you try to paint them. 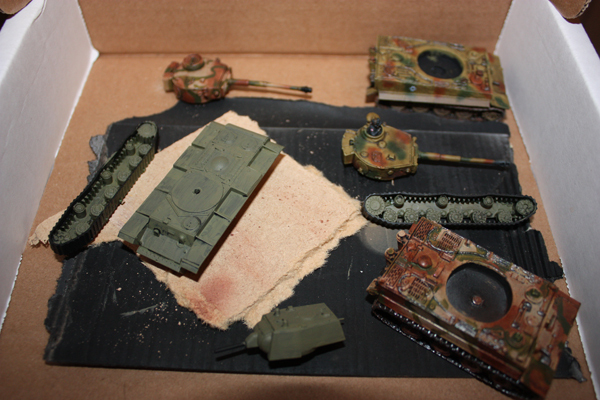 I never base tanks but after the tiny parts falling off scenario I can see wisdom in doing just that so my fat fingers don’t squeeze off a mud flap or two. Airbrushing tiny detail is difficult and its easier using free hand. Ignore pictures of other models on the net and use real pictures to get the detail correct. Leave gluing on tracks/wheels until last or you cannot get behind these areas. The picture below is my work in progress. The KV is a plastic Zvezda. I`ll update as I progress, if I progress ? If anybody has any tips/hints on painting these mini beasts please feel free to share your secrets.